This area reminds of somewhat of the Canadian Rockies and the Alps, but it is also very different having its own personality. The scenery is spectacular. All the guide books rave about it and they are inadequate. Our first stop was about forty kilometers away from Oslo and called Spiraltoppen. It is a road to a viewpoint. The interesting part is that the road is all in a tunnel and is a spiral. It makes six complete revolutions inside the mountain before coming out right above where you went in. It is like driving up a giant corkscrew. Very strange but one of those interesting things to do just to say you've done it. Then on to the coast. 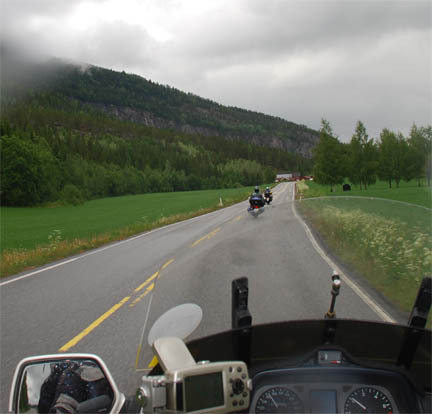 It is getting on towards the summer equinox and lots of bikers are heading for Nordkapp. That is also our destination but we won't make it for the equinox. We are seeing lots of bikes of all styles and most are loaded with camping gear. We crossed over the mountains by taking a road up a valley and through several tunnels. It got colder as we climbed until we came out of one tunnel and found an ice-covered lake on our left. Thank goodness it warmed back up when we dropped into the fjord with the town of Flåm in it. We stayed at the campground (the only one in this tiny town) and it was one of, if not the, cleanest and best kept up we have ever stayed in. Not fancy, just very neat and clean. 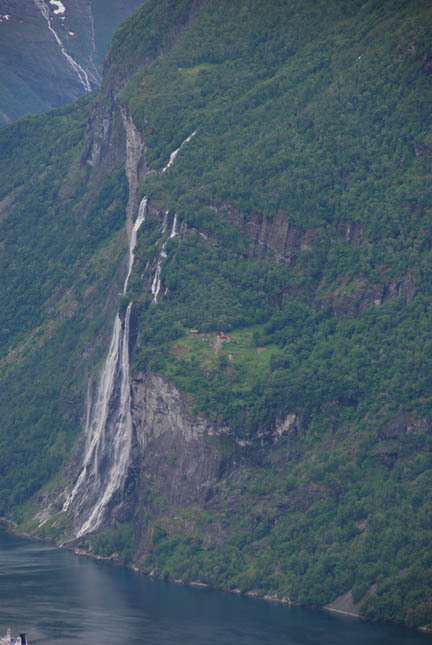 The town of Flåm has about 250 residents, and 500,000 visitors every summer. The next morning there was a cruise ship at the dock disgorging people without end. We said good-by and left. FYI, there is a brand new brewpub with an excellent IPA in Flåm. 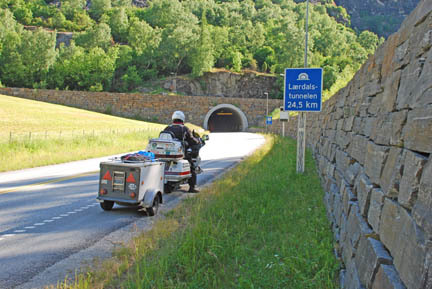 Our main reason for going to Flåm was that it is one end of the longest road tunnel in the world, 24.5 km. (16 miles) long. It took almost a half hour to drive through it. It had large chambers at the 1/4, 1/2 and 3/4 distance that were large enough to turn a bus around in. The interesting part was that they were lit with blue or green lights. That is actually the way the tunnel looked at that place, very strange. Over the rest of the day we traversed several more tunnels with lengths of 3.5 to 7 km. 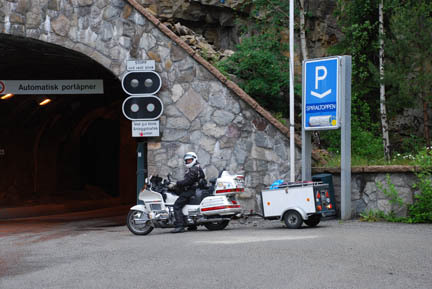 All told we drove over fifty kilometers in tunnels that day, as well as take two ferries. One ferry ride actually docked at the mouth of the tunnel. Along the way we had to stop at Fjærland. 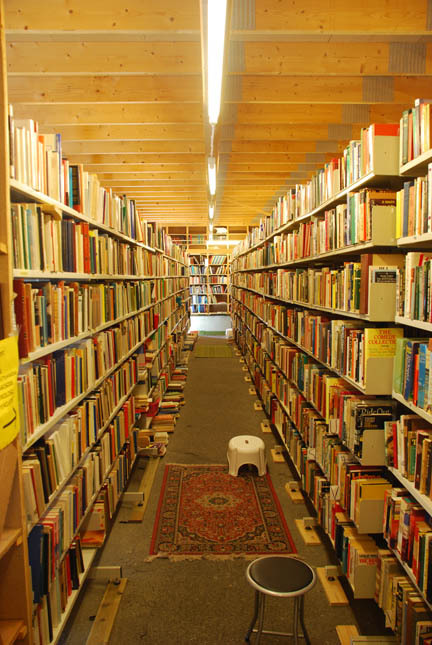 This tiny town is the used book shop of Norway with over 4 km. of bookshelves (according to our guide book). This town was nearly as big as Hay-on-Wye in Wales. (Click the link for more info and pictures.) But the books were much more neatly kept and shelved. One big difference is that in Wales almost every book was printed in English, here it was only a small percentage. But still we bought three more books. That night we camped in a fjord with a glacier at the head of it. The views are astounding. The weather is pretty good. We have had a couple of showers but the afternoons are often sunny and we have not had to set up or pack up camp in the rain. 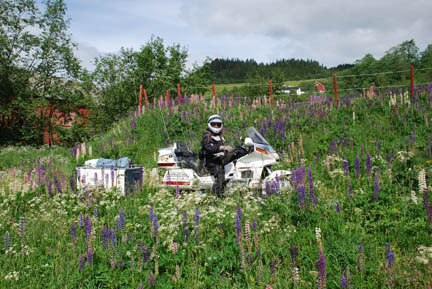 Our planned route takes us north along fjords, over mountains, through tunnels, past farms and through little villages. After packing up camp we drove down the valley to the waterfront village of Olden (in most fjords the salt-water only comes partway up to the end of the valley) where we bought gasoline and went to the grocery store. The cruise ship from Flåm was docked here. And the 2300 passengers were all coming ashore again. Several of them had seen the bike when we drove past the ship as we left Flåm. They recognized it in front of the grocery store and came over to talk. So our 15 minute stop ended up taking an hour. Oh well, we're retired and have lots of time. We finally left and drove to another ferry dock, only this one didn't just go across the fjord, it took a 20 km. trip up the fjord to the town of Geiranger. We came from the right and docked near the cruise ships on the left. Then we followed the road up several switchbacks to this lookout point. 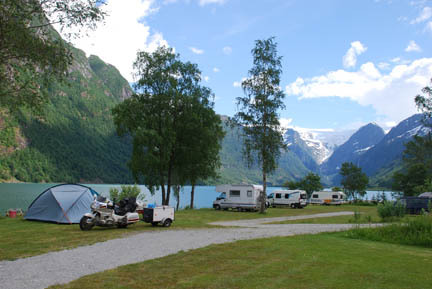 Fjords are round-bottom valleys carved by glaciers during an ice age. They have very steep sides, including the upper end, and when the bottom is below sea level are filled with water. They have waterfalls that drop hundreds of feet down the sides. One is just visible on the right side of the fjord just before it disappears around the bend on the right of the picture. This is that waterfall again. But also notice the farm on the flat halfway up. Access is by boat (the dock is by the triangular rock patch on the right at the water) and a hike up to the house. How would you like to bring the groceries up that after a big shopping trip? There were three of these farms along the 20 km. trip that we made. A second is across the fjord on the top of the cliff. It is visible as a tiny brownish patch on the right in the big picture above. A trail comes from the town on the left side to it. This one is not occupied but the other two have people living in them today. The third is out of sight around the bend and requires a ladder for part of its access trail. This area of fjords is a lot like the Alps in Switzerland, expanded out to the size of the Canadian Rockies and then pushed half underwater. It is magnificently scenic country. Another trip across snow-covered Alpine mountains and we came to the Trollstigen. 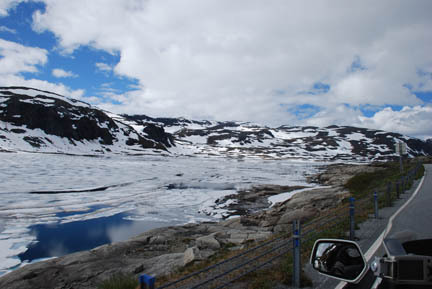 This is a famous mountain road that descends (going our direction) the headwall of another fjord. This is so famous that the tourist shops have a certificate you can buy that lists the date and is "suitable for framing" that you passed through here. We rode down the road. It is a lane and a half wide with good pavement, no problem at all. The switchbacks are not nearly as sharp as the ones in the Alps and the road is wider. And the Tizi 'n Test pass in the Atlas Mountains of Morocco was even worse, the pavement was in bad condition as well. From here more tunnels and another ferry ride and we took the road up a valley to Trondheim, the largest city in the area. We found a campground and set up camp near a power outlet and a row of brush. Little did we know that on the other side of the brush were the train tracks. Every time a train went by the bow-wave of wind would puff then flutter the tent walls, and they went by until 11:30 that night and started again at 4:30 the next morning. I set up the computer to download the pictures from the camera chips and work on these web pages. 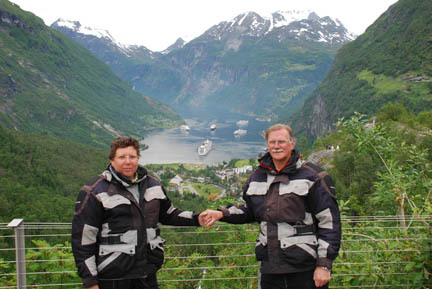 Somehow all the pictures we had taken of the Geiranger and Trollstigen were gone, except one. Now I know it couldn't possibly have been "operator error" so there must have been some sort of troll in the computer that ate them. We decided to go take them again. The next day we headed back to Geiranger, but on a different route. This one led past a stave church with magnificent medieval dragons on the roof peak. This church was built in the late 1100's. It was been expanded into the cross shape from the original rectangle in the 1600's and the dragon's were added too. I've not seen or heard any explanation for the dragons but they are very common on stave churches. These dragons are 1960 copies of the original ones, one of which is badly weathered and on display in the museum. As we have traveled the countryside we have seen many buildings, both farm houses and outbuildings, that could easily have qualified for a place in one of the open-air folk museums we have been to. They are in fine shape and just as old. 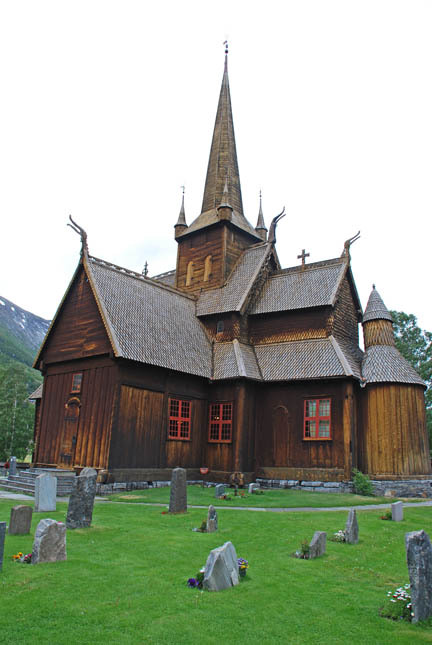 The only problem is that they, like this stave church, are still be used and lived in on a daily basis by their owners. We came into Geiranger by road from the south this time and came down a road that dropped down the headwall of the fjord and was as curvy as the Trollstigen. It had this viewpoint of the town. Our campsite was on the waterfront just behind the large cruise ship in the center. The panorama picture above was taken from a lookout a little above my head. The next day we drove over the same road as before to the Trollstigen and took more pictures there. Both panorama pictures are from this trip. 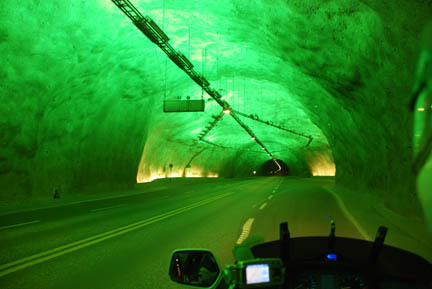 Then we took different roads, ferries, bridges and tunnels, including the deepest road tunnel in the world, back to Trondheim. We have driven; by the water (road), on the water (ferry), over the water (bridge) and under the water (tunnel) today. As we have been going north we have been pacing the springtime flowers. Here is a patch of Lupine we found. The weather has been scattered showers ever since we arrived near the coast, but the sun came out just for this picture. We are back in Trondheim, at a different campground, and it is raining again. A couple days here to see the sights, and put new front brakes on the bike (these steep mountain roads have taken their toll [or is that troll?!!] of them), and we are then off to the Northern Fjords.